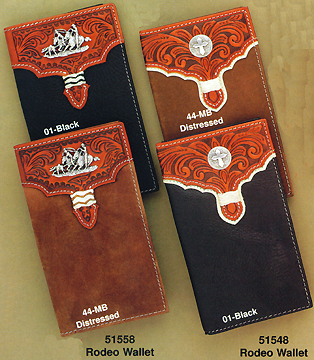 The longest of these rodeo wallets can serve triple duty as a checkbook cover, and as a decorative adornment for your favorite back pocket too. 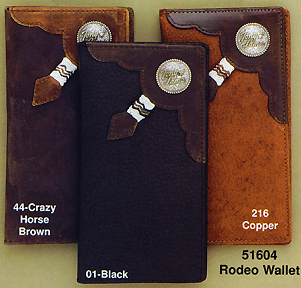 Cowboys seem to be a fancy lot, and most of these Western Billfolds, Western Trifolds and Western Checkbook covers will fill that need. 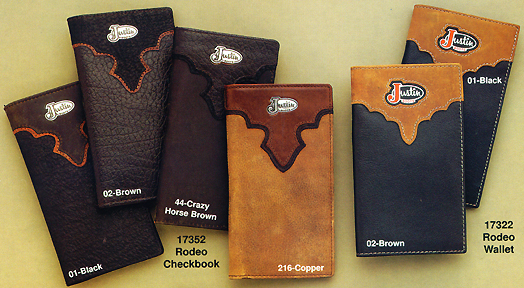 Most of these are great dress wallets. 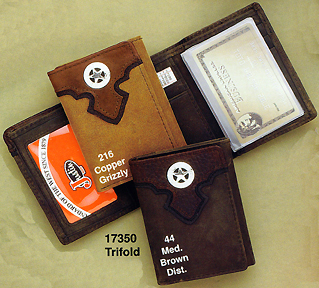 Some are especially good for everyday working sweat and grime. 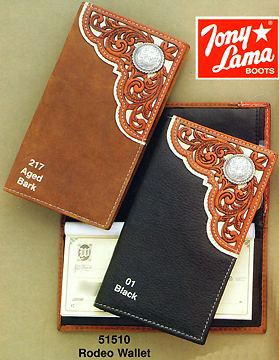 All are well worth the investment to keep cherished pictures and valuable papers secure and safe. 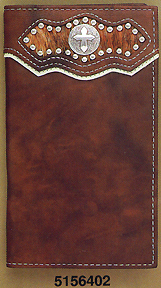 Here's another one that makes a good belt match. Look at how that cross jumps out at you without being obnoxious. 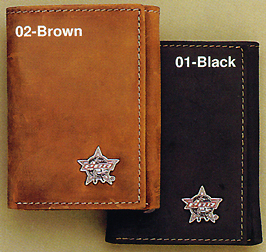 First time I saw this scene was with Lazart Home Decor. Got it in my guest bath. God Bless us all! 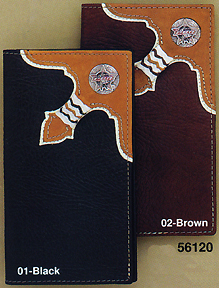 Continuing on, I think that if a praying cowboy is on our wallet, we might think 2X about where our money goes! 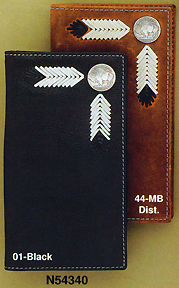 The lacing on these wallets reminds you of an eagle feather. 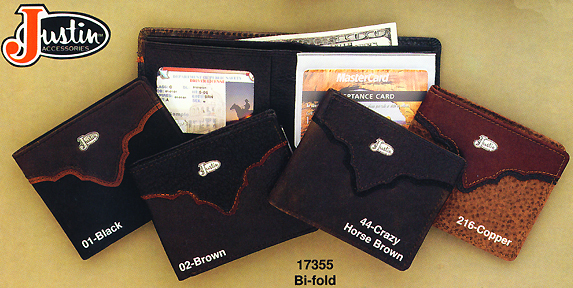 Plenty of room for everything you need to carry. 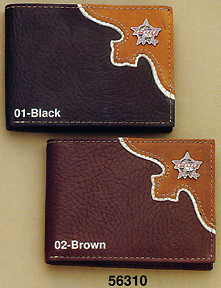 U can B a Star! 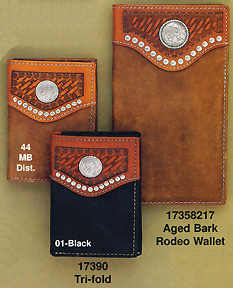 This model is good when you want a little more room in the folded money section. 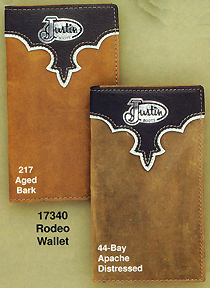 More Justin Boot matching styles. 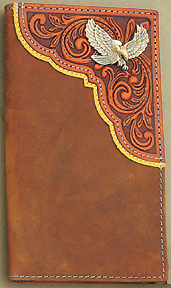 How about some fancy for your fanny! 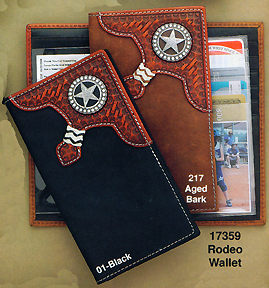 Rodeo events are part of being a cowboy. 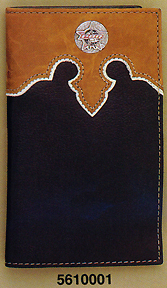 Team Roping & Prayer! 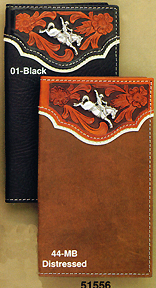 Ok, we had to throw in a horse head in case you don't ride rodeo. 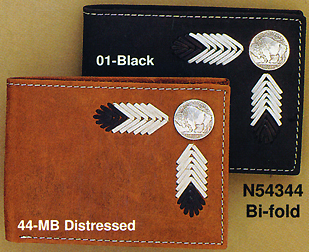 Buffalo Nickels and Eagle feather looking laces. 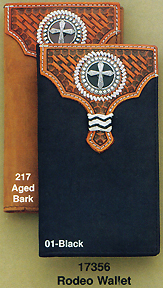 Intricate tooling...not too much, not too little! 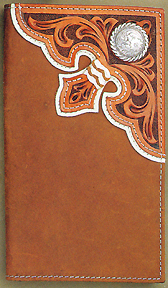 Just a touch of hair-on-cow, for emphasis. 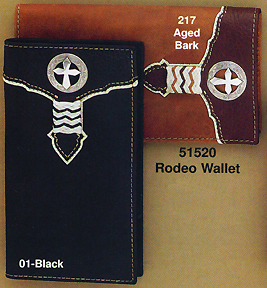 The eagle flies for cowboy and biker alike... Freedom! 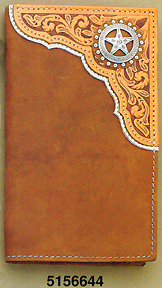 Yes, the braiding is done by hand. 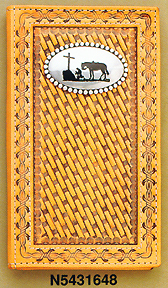 Tony Lama Emblem on concho. 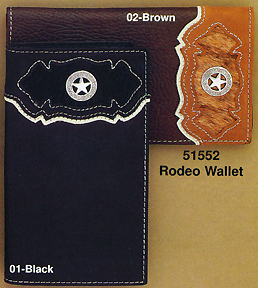 This Rodeo Wallet style has become a classic. 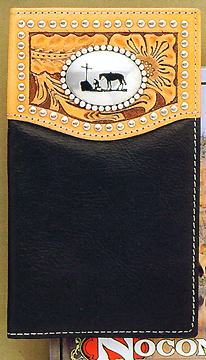 PBR Concho with hand braiding. 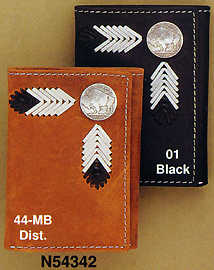 PBR Concho on a classic Western Wallet pattern. 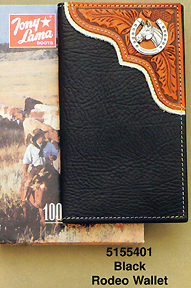 PBR Concho on a textured leather billfold. 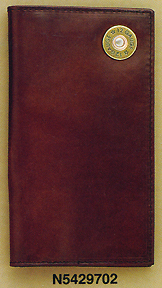 Removable passcase. 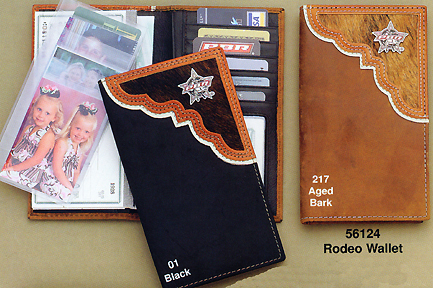 PBR Concho on a leather trifold. 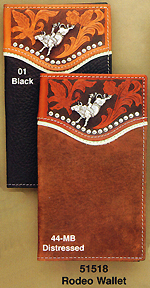 PBR Concho on a textured leather billfold. 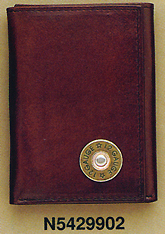 Shotgun shell on leather billfold. 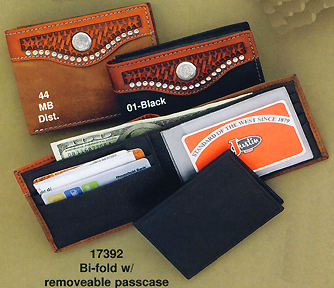 Removable Passcase. 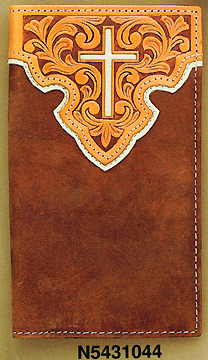 Shotgun shell on leather trifold. 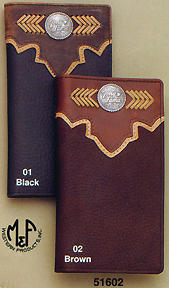 Shotgun shell on leather rodeo wallet. 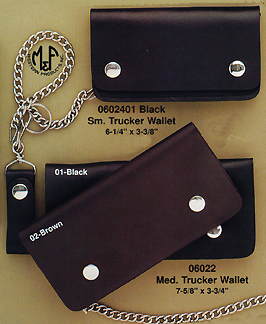 6 1/4 X 3 3/8 Trucker's Wallet on a chain. 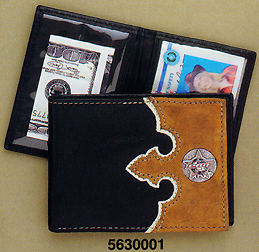 7 5/8 X 3 3/4 Trucker's Wallet on a chain. 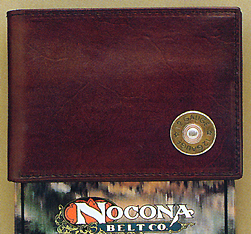 Just below, you can find links to more wallets, and then, links to all Nocona Belt products!